Head to Grovedale these school holidays. 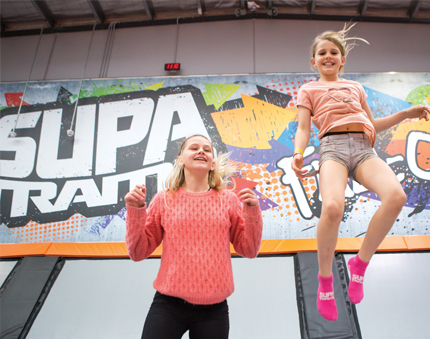 SupaTramp, on the Torquay Highway, Grovedale, is a huge indoor climbing and trampoline park. It is also an activity complex that offers exciting and challenging experiences for children and adults. 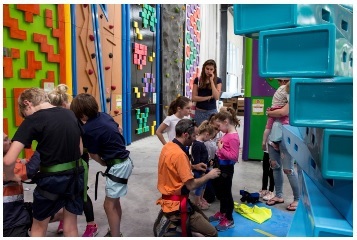 If you're looking for things to do with the children in Geelong these school holidays SupaTramp has a great children's playground with a huge indoor climbing facility that is safe for children aged 12 and under. The Playground has a dedicated soft play area for the toddlers, small trampolines with soft padded seating so parents can help their toddlers learn to bounce, and there is a huge multi-level enclosed climbing structure to give the children space to challenge themselves and explore. 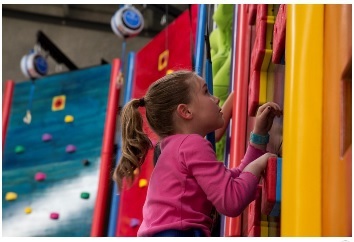 Clip N Climb consists of a vast array of walls and indoor climbing challenges. There will be a 15 minute safety brief before participants can tackle the walls and indoor climbing. There is an extremely safe auto-belay system which means you don't need a partner at the bottom watching you climb. 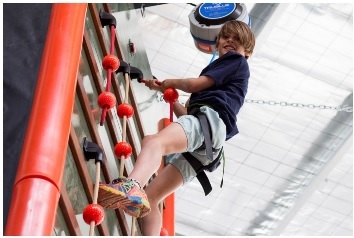 You can race your friends up competition walls, or test your skills on moving, climbing elements and have fun on a new type of climbing system. The clip n climb walls are suitable for adults and children. When you buy a general admission "Bounce and Climb N Climb" pass, admission to the Clip N Climb area is included. 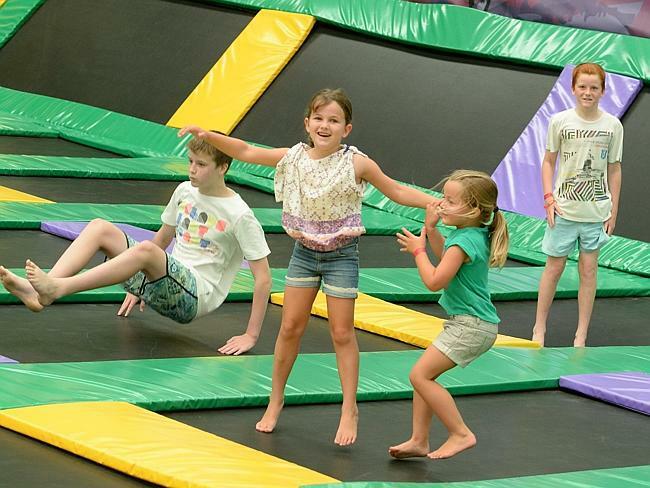 The Open Jump area allows people to experience the fun and freedom of bounce. There are over 40 interconnected horizontal and inclined trampolines so you can jump. turn, twist and flip in a massive open arena. This is a great activity for all ages. It is low impact so easy on the joints and muscles. It lets you use up some of your energy. This is a great way for your children to use up their energy, jump and spin and twist, and get some exercise as well. The Open Jump area is included in your general admission "Bounce and Climb N Climb" pass. The Supa Slam area has three netted tramps with rings to give you a chance to improve your basketball dunk moves. You can jump up and get a bit of air between you and the trampolines and dunk like a pro. 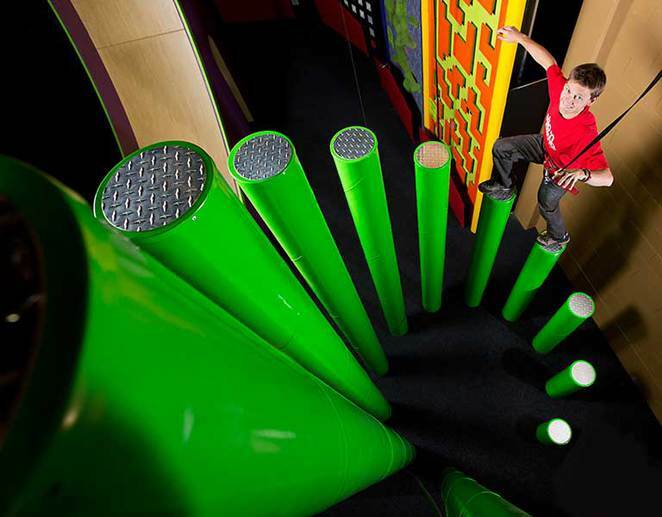 The Supa Slam area is included in the general admission "Bounce and Climb N Climb" pass. The Supa Wall area has 4 performance tramps for jumpers who want a little bit more bounce and challenge. There are walls at varying heights surrounding the performance tramps. They offer jumpers a unique opportunity to try wall tricks in their session. The Supa Wall is more suited to experienced jumpers who are looking to extend their tricks, by incorporating the various walls surrounding the tramps into their repertoire. The Supa Wall area is included in the general bounce admission. General Admission to SupaTramp is $18.50 for the 1st hour, and $11.00 for the 2nd hour. Off Peak Junior (under 5 years old) - $10.00 for unlimited play. Parents can supervise their Junior for free. Off Peak Hours are from 10.00am to 2.00pm during school holidays. Please note: Re-usable grip socks are not included in prices above. The socks can be purchased on entry for $2.00. There are other areas and opportunities for the "jumping" fans amongst you. You can try the SupaFit area, the SupaAir or even join a game of DodgeBall. There is also a children's playground. It is a great complex that offers many different activities. The building of the Supatramp centre at 182 Torquay Road, Grovedale started in May / June 2014. The building of the complex was valued at $4.5 million dollars. David Schwarz, a former footy star, has been planning this project for almost four years. He says that it will be the largest complex of its kind in Australia. 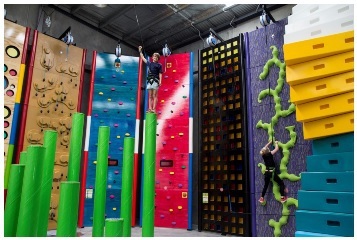 The centre will feature 140 trampolines, state of the art climbing equipment, a laser tag centre, a toddler play zone, a health focused cafe, and equipment tailored for thrill seekers with a disability or with special needs. David Schwarz was a centre-half forward for Melbourne. He lives in Barwon Heads now. David works in Melbourne media with Channel 7, SEN radio and he writes a column for the Geelong Advertiser. For the Supatramp venture, David has teamed up with Neville Wright to develop the SupaTramp proposal. Neville Wright is a Bellarine Peninsula businessman and a family man. The planning approval was secured for the split-level building. The SupaTramp complex will feature 3,500 square metres of floor space. It is expected to create at least 60 local jobs and will hold at least 200 people at any time. David Schwarz says that everything will be the lastest, best and safest equipment. It will be for all ages. The experience will be good for mums and dads as well as for the children. This facility will be good for Geelong and will bring in lots of people from outside the city as well. SupaTramp will be able to host birthday parties, Blue Light discos, school and sports groups, competitions, fitness classes and boot camps. NOTE: It's best to arrive 10-15 minutes early for preparation, as this will ensure you get to have the whole hour of play time. Shoes must be worn on the Clip N Climb area.